Think swimming, then think fun, with water leisure attractions one of the biggest draws for the modern holiday park destination. Park operators need to provide appealing facilities for all age groups, with a typical water leisure offering including cannons, waterfalls, rain curtains, fl oor volcanoes and wall-mounted massage jets to add more attractions to the pools. Achieving this – and still providing an acceptable return on investment – requires very careful planning at the design stage, particularly where space is limited. Water slides and flumes have always been popular, but they require a significant capital investment, huge amounts of energy to drive massive pumps and constant life guarding. 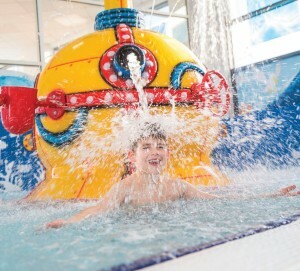 The main aim of aquatic play equipment is to allow kids to have fun in a safe environment. Playing with water is also a vital part of a child’s development. Hippo Leisure’s modular play equipment, including Water Factories, Interactive Masts and Play Platforms are all extremely versatile products and can be expanded or updated to help to encourage regular, repeat visitors. 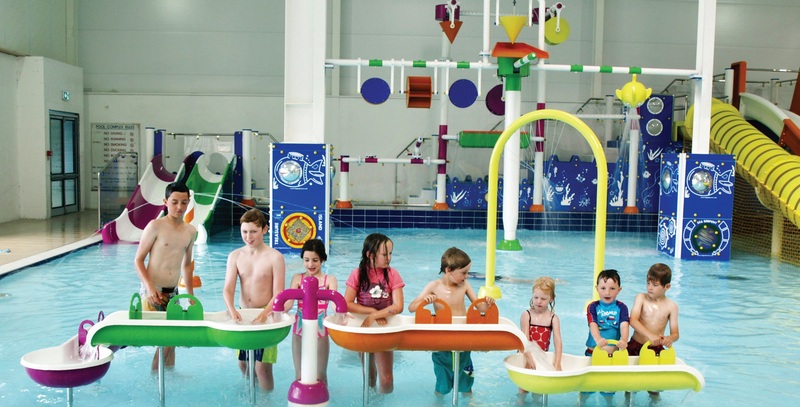 “What you’re aiming for in your facility is a way to keeping the whole family entertained, regardless of age or ability,” comments Teresa Metherell, Marketing Coordinator for Hippo Leisure. “This can be achieved by installing a variety of interactive water play features that provide both low level sensory play for toddlers as well as high level anticipatory and big splash play for older children and even adults,” she adds. The naturally inclusive and adaptable nature of a zero-depth splash park makes it an excellent amenity for holiday parks seeking to increase family attendance. Ustigate is a partner of Vortex International of Canada, offering a product portfolio of over 300 aquatic structures specifically designed to meet any specification, from low water consuming products for once use systems to super soaking buckets which create tidal waves. The range includes many interactive free-standing products, the Water Journey collection, inspired by nature’s streams, and the Elevations range, are play structures that provide great combinations of water features between platforms of varying heights, encouraging children to climb and move between levels while engaging with children on and off the unit. The Elevations can be installed inside or outside, as part of a splash pad scheme or in a wading pool – They are designed to take fun to the max and are offered with a choice of water slides for the ride down. Vortex is a world leader in aquatic play solutions, having completed 7000 installations in 45 countries, all of the products are renowned for being robust and innovative. Vortex recently announced the Explora collection has won two International Design awards, taking Gold in Leisure Games and Fun and Silver in the Social Impact category. Like all Vortex products, the Explora collection integrates a strong active play component that keeps children moving, pushing, pulling, spinning and exploring. 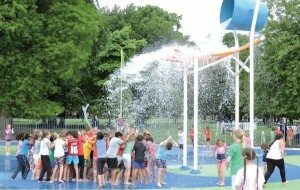 The price of a typical splash pad depends mainly on three factors; size of the scheme, the type of water system – either a once-use or recirculating – and finally the selected water features. A typical once-use system would cost about £100,000 and the majority of recirculating systems are priced from £250,000.